Li Na was crowned the Australian Open 2014 champion and by fault also makes the best dressed list this year. 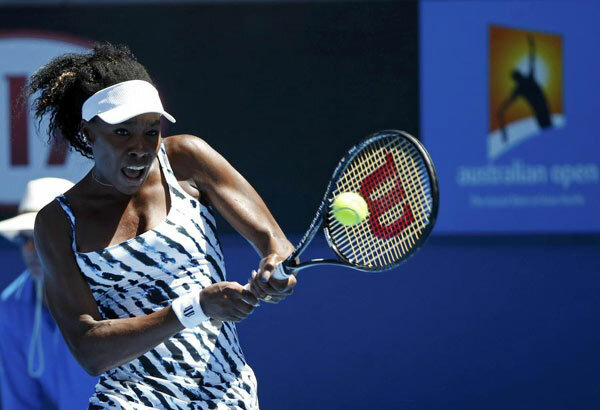 Overall, the top apparel manufacturers have moved away from the yellow and yellow-accented kits which have dominated player looks since the Australian Open switched over to blue courts (from green courts) in 2008. The two-time defending champion was knocked out of the tournament in the Quarter Finals by Aga Radwanska. However, her Nike kit was perfect. The pink contrasted well against Melbourne's ocean of blue courts. In addition, her patterned top prevent a reappearance of the bat signal sweat mark which made her 2013 US Open kit so unfashionable. Angelique Kerber sported Adidas's kit, but managed to look fantastic wearing blue-on-blue-on-blue courts. Angelique wasn't given the marquee Adidas designs worn on glam stars such as Ana Ivanovic and Daniela Hantuchova; nor did she have to rock the peculiar Adidas by Stella McCartney dresses. But she made the list while those girls didn't. Kudos. Venus looked lovely during her all too short appearance in Melbourne. This tie-dyed dress from EleVen looked unique and functional. The young American signed a deal with Asics during the 2013 off-season. She looked pretty in pink down under. Champions make the cut by default, right? Although, this basic Nike kit was a bit boring, everyone loves a winner! Here's to the 31-year old champion! Add your picks to the comment section.